Jesus made His points in stories. He was telling the Truth in a world that was – and is – ruled by liars. These liars are controlled by the father of lies. Liars like long words, religious words, political words, psychological words. Complexity rules their language. Twisted sayings confuse and distract from what’s real. Take, for example, the word “perverse.” It has come to be used today in relation to sensual things. Really, to be perverse means to tell something in a crooked way, to craft a deception. Jesus came from Heaven to Earth and took on skin to live as we live. He also took up the language of the day. He told the Truth with still, small, short words. His references were simple references connected to the little stuff, the real things, the close-at-hand things. When Jesus taught, He spoke of sheep and goats, farmers and fields, vineyards and herbs, trees and plants. He talked of coins and lamps, suppers and marriages. The everyday stuff formed the foundation for the big message of the Gospel. Seeds, Jesus talked about them, and as He did He scattered them about. The Word of God was made to take root in hearts open to Him. He told the Truth in a way that captured only the purest of imaginations. Those with vain ambitions and selfish motives scoffed and dismissed His message. The common people heard Him gladly because He talked their talk. He bid His disciples not only to let the children come to Him, but He bid them to become child-like. To know and love Jesus is to know and love stories as children know and love stories. Even when He related something as important as prayer, Jesus would tell a story. “Teach us to pray,” the Apostles asked the Savior in Luke 11. He provided a short outline that we’ve come to know as the Lord’s Prayer, or the “Our Father” prayer. But just after that, Jesus gave the illustration of one in need who goes to a friend’s door at midnight and got an answer. With a story, Jesus encouraged His disciples to ask, to seek, and to knock, as children do — for the Father can be found, He will give, and He will open His door. The story I want to focus on now comes to us in Luke 10. It is a well known story, one that even people outside church world know something about. 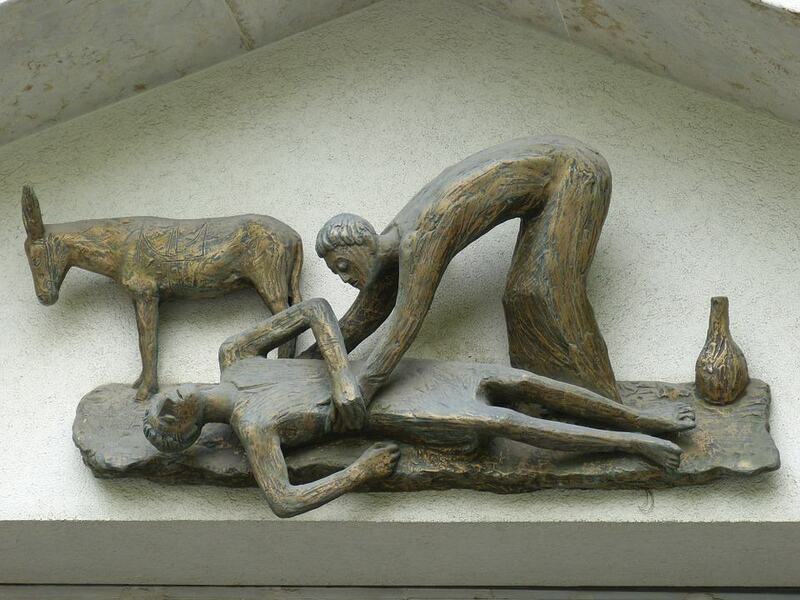 It is the story of the Good Samaritan. The story is given because Jesus is asked a question by a lawyer or Bible scholar. This was a man of the Torah, a man who carefully dissected the words on the pages of Scripture. He came to test Jesus with a question. Jesus took the opportunity to tell a Jewish religious authority about a Good Samaritan. And why was the Samaritan good? Because he knew how to be neighborly. That is, he knew how to show mercy that makes a difference. In this account, a traveler gets mugged. He’s robbed, beaten, and left for dead. Two religious men – a priest and a Levite – see this man by the side of the road and render him no aid. Instead, they take extra steps to pass him by on the other side of the trail. Priests and Levites would have been among the Bible scholar’s associates, I am sure. He would have known men such as these. He also knew of Samaritans, a mixed people group who were somewhat Jewish, but not Jewish enough to participate in Temple practices. They were generally avoided and counted as people who did not follow the true practice of Jewish Law. The Samaritan in Jesus’ story stops, dresses the man’s wounds with oil and wine, sets him on his beast, and delivers him to the safety and comfort of an inn. The Samaritan even pays for the man to be cared for and promises the innkeeper that he will cover any added expenses. Show mercy, that’s the way of the neighbor. And, it’s the way of Jesus. I think we can see Jesus as the ultimate Samaritan. He saw this world battered and robbed of its beauty and glory. Lies, lies, and more lies have brought a corruption that runs deep. Jesus poured the oil; He sent the Holy Spirit to seal us and anoint us. Jesus poured the wine; He shed His blood to cleanse us from guilt and shame. His humanity bore the load of judgment for all the sins of the world. His resurrection confirmed His redemption and opened to us a place of safety and security from death and from the fear of it. He’s promised to return to this earth in His glory. Until that time, He has raised up His Church to seek the lost, to care for the wounded, to shelter the helpless and the homeless, and to love, to serve, and to heal. Jesus became our neighbor and showed us how to love our neighbors – all of them. This great High Priest would not pass us by. He entered right into our troubles and turmoil. He endured wounds inflicted in hate and bitterness. God so loved us and gave Himself for us all. May we go and do likewise, in His Name.